Two fair dice are thrown together. what is the probability that the number obtained on one of the dice is a multiple of the number obtained on the other die? What is the source of this question? I ask because you've listed just 4 answer choices, which is not realistic. 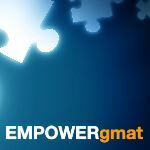 If you're studying from material that is not proper GMAT material, then you could very well be hurting your chances at scoring at a high level on the Official GMAT. Regardless, here's how to answer this question. Each of the two dice has 6 possible outcomes (1 - 6, inclusive), so there are (6)(6) = 36 possible pairs of dice rolls. Find the pairs in which neither is a multiple of the other. Ignore all pairs with 1 since the other number will be a multiple of 1. If one number is 2, the other can be 3 or 5. So two possible options. We could have 2 on the other die so total 4 options (2, 3) (2, 5), (3, 2), (5, 2). If one number is 3, the other can be 4 or 5. Again, there will be 4 total options. If one number is 4, the other can be 5 or 6. Again, there will be 4 total options. If one number is 5, the other can be 6. There will be total 2 options.